Namrata Shirodkar after winning Miss India crown forayed into films down south romancing Super Star Mahesh Babu in Vamsi. Both not only romanced on screen in Vamsi but also fell in love with each other in real life. Namrata and Mahesh Babu celebrated their 14th wedding anniversary yesterday on Feb 10 and delighted privileged kids from Devanar Blind school, Begumpet, Hyderabad by offering them a sumptuous meal. Namrata speaking to scribes turned her romantic clock with Mahesh Babu 14 years back and recollected how they fell in love. When asked how Mahesh who is extremely reserved fell in love with her and proposed first. Namrata recollecting the incidents said, “We went to New Zealand for Vamsi schedule. We shot for 25 days there. I never shot for so many days in outdoors. Babu is very shy and so never used to talk with anyone. However he used to speak quite freely with me. We became friends before that and friendship blossomed. Later after returning from New Zealand, we realized that we were in love. I think I proposed to him first. Yes... I only proposed." 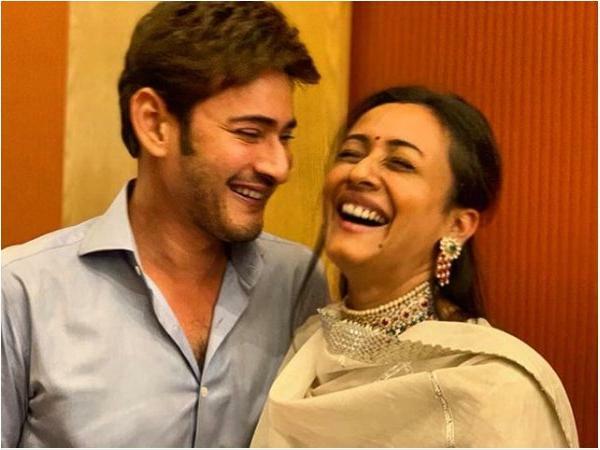 When asked what Mahesh’s reaction was, Namrata with a smile said, “I proposed to him over phone. We were very far and so I couldn't see his reaction. By that time he too was in love. He knew about me completely and same was the case with me. After the proposal, we decided to enter into wedlock." When asked why she waited for four years after falling in love, "I decided to complete all my film commitments. Vamsi was Mahesh's third film and he started his career at that time and was planning to take it to the next stage. I too signed few films and so planned to complete them. So it took some time and I think we waited for three years." She said she will say sorry to Mahesh if any differences crop up. She said under those circumstances but sit together and sort out the issues. She stated they till now did not face any problems. She added Mahesh takes his decisions on his own and she will not interfere in any of his professional decisions. She further stated Mahesh is lenient and she is a strict parent and so is the villain in front of them.